The team at Convince & Convert and I have been working with Comcast for nearly two years, helping them understand the landscape of customer experience influencers, and how that community thinks about CX transformation and storytelling. Last week, as part of that work, I was joined at the Comcast headquarters in Philly by a cavalcade of all-star customer experience thinkers: Chip Bell, Jeanne Bliss, Joey Coleman, Steve Curtin, John Dijulius, Matt Dixon, Moira Dorsey, Shep Hyken, Scott McKain, Adam Toporek, Bill Quiseng, and Jeannie Walters. We gathered together to spend an entire day behind the scenes with Comcast executive leadership, including Chief Customer Experience Officer Charlie Herrin, discussing the commitment the company has made to turn around a customer experience that has historically been far less than optimal. The company has invested hundreds of millions of dollars, embarked on the largest Net Promoter Score implementation in history, and has made more than one million customer callbacks in just the first 10 months of 2018. (Every manager in the company, regardless of role, is now required to call actual customers on a regular basis). The commitment made to this transformation is staggering and is bearing fruit in hundreds of ways, large and small. For example, customers receive a $20 bill credit if technicians are late for an appointment. Customer service response times are way down, especially in social media, where Comcast now has 408 full-time equivalents (FTEs) handing social care. And the xFinity product line is riddled with self-healing functionality and easy diagnostics. Comcast fundamentally believes that better, simpler, more intuitive products are the forward guard of CX. The 80,000+ employees are dialed in on this course trajectory, which is crucial. In fact, Comcast has spent as much, if not more, time and money on internal CX and culture change than they have on customer-facing enhancements. This “inside out CX” approach is absolutely a requirement for meaningful, long-term change to occur, particularly in service-oriented businesses. As you might imagine, a course trajectory change of this magnitude takes years. Today, a lot goes right. And a few things go wrong. Sometimes more than a few. But as a Comcast customer, I can personally attest that the customer experience and customer service improvements are numerous and real. But they are also largely hidden. This is the great conundrum for Comcast: how do you convince people you’ve changed? For example, during this CX Influencer Day, my colleagues and I received a technology briefing from Comcast’s Senior VP of Digital Home, Devices, and AI, Fraser Stirling. He showed off several interesting features, many of them using the xFinity voice remote. For instance, press the microphone button and name any NFL player, and his stats appear. And a lot more ninja tricks are rolling out soon. It’s a ton of behind-the-scenes work and expense to make all of this synch up. We asked him why Comcast was making that investment, and he said he felt it was his job to make people love television again. He said emotion comes first. 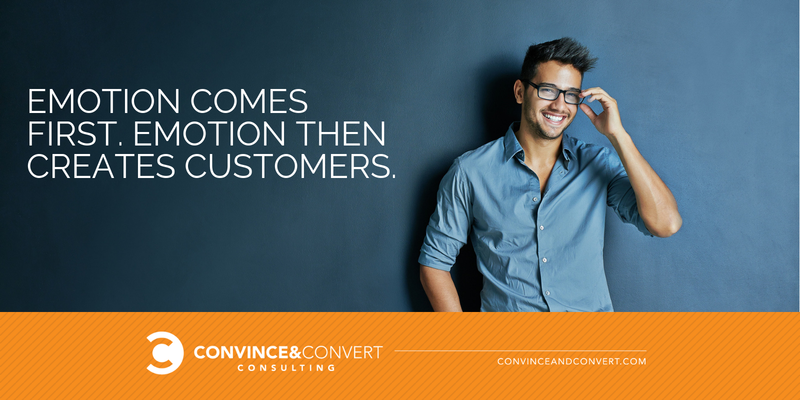 Emotion then creates customers. It all makes sense, and the company’s commitment to iterative product enhancements is commendable. But how do you create the emotion if people don’t know about the cool stuff that will trigger it? I wouldn’t call myself an avid television watcher, but I do watch a bit, as do some of the other CX professionals who joined me in Philadelphia. And NONE of us were aware of some of the features that Fraser demonstrated, even though they are currently available in our homes. At one point, he said one of the voice remote features was “a bit of an easter egg.” And it got me thinking, particularly since I drive a Tesla that is full of hidden tricks, isn’t the difference between a “feature that triggers emotion” and an “easter egg” simply the number of people that know about it? To me, this is also part of the challenge currently faced by Amazon Alexa and Google Home. The ability of those devices to add value to our lives is out-kicking the coverage of our ability to stay on top of what those abilities actually are. Discovery takes time to occur organically, and I wonder how Comcast could be more proactive in alerting customers to what is actually at their fingertips or lips. Comcast faces a similar challenge with the customer experience turnaround story at large. Charlie Herrin talked extensively with us last week that “trust must be earned” from customers, and he is, of course, correct on that point. But HOW do you earn that trust if you’re a company like Comcast? How do customers — some of them longstanding and frankly, long-suffering — get the message that there’s a new CX sheriff in town? Comcast runs some ads on this theme today, talking about their commitment, showing their technicians in action, and so forth. I’m not sure there’s much impact here. The “believe us, we’ve changed” commercial is quite the trope in modern, American business and you could build a hall of fame to house the gauzy, piano-laden contributions from Toyota, Facebook, Wells Fargo, and many, many others. These 30-second corporate pinky swears say the right things, but there’s a reason why it’s called customer EXPERIENCE. So if you’re Comcast, I think there are only two options to regain the trust of any particular customer or former customers, and both are marathons, not TV-aided sprints. First, you put up such a long string of uninterrupted, error-free service that it slowly begins to dawn on the customer that “hey, these guys have their act together.” This is the electric company model of trust-building. If I flick a switch 5,000 times in a row without incident, I begin to believe that those responsible for illumination are pretty good at their job. The trouble with this approach is that it’s massively susceptible to glitches in the Matrix and disturbances in the Force. This method of regaining customer trust works like an ice cube tray: every day that goes by the water gets harder. But one little problem — somebody leaves the freezer door open just a crack — and you’re melted. Back to the beginning. For xFinity, there are a lot of ways that door can be left open: weather, up or downstream tech issues that aren’t their responsibility, and customer errors. Airlines have the exact same problem. Without even talking to you, I can tell you your least favorite airline: the one that disrupted your travel plans most recently, for any reason, even if it had nothing to do with the airline itself. It’s possible to earn trust and rebuild a CX reputation using this consistent, long-term excellence model, but boy is it hard, and unreliable to boot. The second option for Comcast to address the conundrum that is changing the narrative around their CX is to simply fix every problem perfectly. There is a ton of research that shows that customers who have a problem that a company successfully fixes are not only satisfied, but buy more and are more vociferous advocates than customers who never had a problem at all. We cite some of this work in my book, Hug Your Haters. To me, this is the opportunity for Comcast. Because amidst increasing complexity, emerging product/service lines like home automation and mobile phone, it seems to me that EVERY xFinity customer will have a problem eventually. I certainly do, from time to time. You’ve heard the saying that the measure of a person isn’t how she or he treats people when times or good, but how they treat you when times are bad? Customer experience and customer service work the same way. 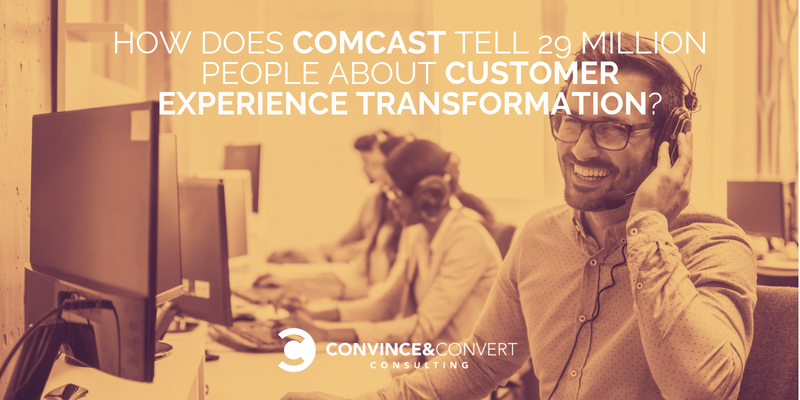 If Comcast can NAIL IT every time a customer has any kind of an issue, that’s the most direct path to gaining trust, creating true, ground-up advocacy, and spreading the word about the overall CX transformation. Customer experience at the product level, done perfectly, makes customer service superfluous, in large measure. The implications for this fascinate me. Customer service has always been looked at as mostly a soft skill, rooted in equal parts empathy and common sense. But Comcast’s approach combines the traditional service approach with a wholly modern idea: what if every product is its own customer service team? Maybe the secret to telling the transformation story at Comcast doesn’t require convincing 29 million people that customer service is better. Perhaps instead, it requires machines to tell that story through customer experience, one robotically fixed problem at a time.